Managing your own family’s health and nutrition is a challenging task. When you add in the nutritional needs of an elderly relative, it can be even more difficult. 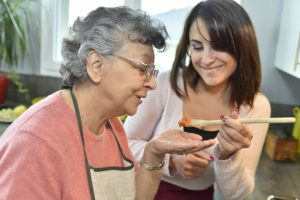 Family caregivers that are helping an aging loved one with daily tasks are familiar with the struggles of getting elderly adults to eat nutritious meals regularly. Malnutrition and dehydration are all too common in elderly people across the United States. As their physical capabilities diminish and finances become tighter, many seniors struggle to shop for and prepare food that meets their nutritional daily requirements. Seniors that live alone have the highest risk of developing bad eating habits. Here are 8 ideas to help family caregivers like you boost their elderly relative’s eating habits and ensure they are getting the nutrients they need to stay happy and healthy. Encourage healthy snacking. It’s easy for seniors to reach for pre-packaged junk food but they’ll do better with fruit smoothies, whole wheat crackers and cheese, and baby carrots and dip, for example. Arrange for friends, family members or elder care assistants to drive them to the grocery store weekly. Often, just getting to the store is the biggest hurdle to getting fresh food and healthy ingredients for meals. Schedule a friend, family member, or elder care assistant to bring in groceries weekly. If the elderly person is housebound, it can work better to have groceries brought in on their behalf. Focus on nutritionally dense meals and snacks. There are many types of foods that are nutritionally dense and are considered superfoods. For seniors that don’t eat much, every bite counts and each one should be packed full of nutrients. Talk to the doctor about nutritional supplements that might benefit the elderly adult. Some seniors may need a supplement of some kind, such as vitamin D or vitamin B12. Only give supplements with a doctor’s orders because too much may be harmful to their health. Use flavorful ingredients and spices to appeal to seniors with sensory impairment of smell and taste. With age, taste and smell can change, making food seem unappetizing. Boosting flavors is a fine way to whet the appetite of an elderly adult. Encourage them to drink plenty of water. Too many seniors skip out on water and other fluids. Incorporating soup, watery fruits, smoothies, ice pops, tea, and milk can keep them hydrated. Organize things so that a friend, family member, or elder care assistant will prepare nutritious meals one or more nights per week. When an elderly person simply cannot cook or prepare meals for themselves, an elder care assistant can close the gap. There’s really no substitute when it comes to a healthy diet and getting the body to optimum levels of health. If you are worried that your elderly relative is not developing good eating habits, there are many different approaches you can take to increase their good eating habits. If you or an aging loved-one are considering elder care in Arlington, TX, please contact the caring staff at Custom Caregivers today. Call us at (972) 702-7988.